so i'm so excited about the up coming craft shows for this holiday season. First the creative alliance show on sunday, dec. 2 ...which Tricia and I have been brainstorming over since we only get one table and can only display on that one table top. we went to ikea today to do some brainstorming..i'm seeing a lot of "snacks" being part of my half of the table. 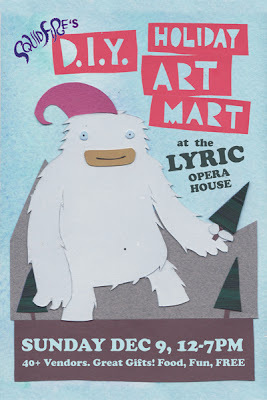 I guess i'm more excited about the squidfire indie craft show at the lyric on the following sunday on dec. 9. i remember going to the lyric as an elementary kid going to see the symphony. now i'm going to be there selling my wares..who da thunk? so write them dates down in your date book! ya hear!